What happened was that while researching the ACORN-SAT dataset, I chanced across a website with a post from July 2012, about four months after the ACORN-SAT dataset was released. The author made the surprising claim that on a number of days in various records in the ACORN-SAT dataset, the minimum temperature for the day was HIGHER than the maximum temperature for the day … oooogh. Not pretty, no. Out of the 112 ACORN-SAT stations, no less than 69 of them have at least one day in the record with a minimum temperature greater than the maximum temperature for the same day. In the entire dataset, there are 917 days where the min exceeds the max temperature. Air temperature is measured in a shaded enclosure (most often a Stevenson Screen) at a height of approximately 1.2 m above the ground. Maximum and minimum temperatures for the previous 24 hours are nominally recorded at 9 am local clock time. 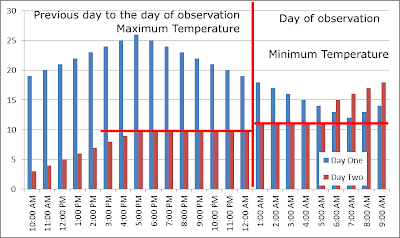 Minimum temperature is recorded against the day of observation, and the maximum temperature against the previous day. If, for some reason, an observation is unable to be made, the next observation is recorded as an accumulation. Accumulated data can affect statistics such as the Date of the Highest Temperature, since the exact date of occurrence is unknown . The chart below is how I understand it. On day one (in blue) the maximum is greater than the minimum, which is usual. 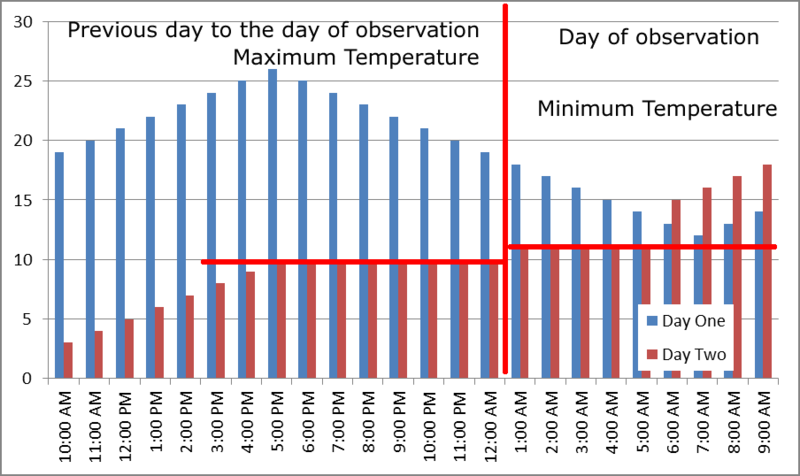 On day two (dark red) however, a change came through and the minimum temperature as recorded on the day of observation to 9:00 am was greater than that of the maximum of the previous day (click the chart to enlarge it). on the date of "the previous day to the day of observation". Say for the Day Two temperature record (dark red columns), the left part of the above chart is the 1st December and the right part after midnight is the 2nd December. The temperature record is for the 1st December. The observation is taken at 9:00 am on the 2nd December. The maximum is the highest temperature reached on 1st December. The minimum is the lowest temperature recorded to 9:00 am on the day of observation. That is, between midnight and 9:00 am on the 2nd December and recorded as the minimum for the 1st December. Consider a day in Kyancutta, the first day of December in 1966 when the minimum recorded to 9:00 am on the day of observation was 13.4 degrees, whereas the maximum (observed on the previous day to the day of observation) was only 13 degrees. The maximum for the second of December was 21.1 degrees as the weather warmed up again. From the newspaper of the day, it looked as if a cool change swept across the country around that time. So that explains why I believe Willis is wrong (again). Feel free to tell me if it's me that's got it wrong. However based on the past history of Wondering Willis, I'd go with BoM any day. Back to Willis's wonderings. He found that there were 917 days where the recorded minimum was greater than the recorded maximum. Each data set runs from a different start date, but let's conservatively set the average recording period at 50 years long. There are 112 stations. That would mean that at most, the minimum is greater than the maximum recorded on only 4.5 out of every 10,000 measurements. That's right. It doesn't happen very often. June 29, 2013 at 2:49 am The BOM clicks on to a new “day” at 9am (presumably when the sleepyheads roll into the office). It is quite possible, but quite misleading, for minima to exceed maxima for a 24 hour period given this. All it takes is a fast moving weather system, of which we get plenty on this vast continent. I wonder how Willis will react. The fact that johanna rips into BoM at the end of her comment will count in her favour as far as Willis is concerned. Another update: After Johanna's comment correcting Willis' mistake, Nick Stokes chimes in and says the same thing. Guess what happens? Does anyone complain about Johanna? No, because she rejects climate science. Does anyone complain about Willis misleading them? No. What do they do? In among the stupid comments, they complain about Nick Stokes of course, because he doesn't reject 97% of climate science in the way the WUWT illiterati do. Update 3: No, Willis. It's not an error it's a convention. Regarding the “explanation”, I don’t care about the explanation. Whatever the circumstances and assumptions might have been, it’s an error. You seem to think that they are somehow prohibited from fixing an error because they’d be “rightly criticized” … are you serious? Do you know how many times these guys have “adjusted” and otherwise changed the data, without any such obvious error? Now, I don’t care how they fix it. They can throw out the bad data. Or they can flag it and leave it in. My point is that doing nothing to an admitted error, in a supposedly scientifically quality controlled dataset, does not give me confidence in their other actions. Temperature records in the United States are especially prone to uncertainty, not only because of high energy use in the United States but also because of other unique problems such as the bias due to systematic change in the time at which observers read 24 h maximum‐minimum thermometers. Victor Venema has written an excellent article describing the problem of changes in time of observation as can typically occur in the USA. Why are the daily temperature maxima and minima for different 24-hour periods? Conventionally, maximum and minimum temperatures are recorded for 24-hour periods ending at 0900 GMT each day. Maximum temperatures tend to occur during mid-afternoon, so the relevant maximum for a given calendar day is the one recorded between 0900 on the day in question and 0900 on the following day. However, minimum temperatures generally occur around dawn, so the relevant minimum temperature for a given calendar day is the one recorded between 0900 on the previous day and 0900 on the day in question. The way I read it is that in Australia, the minimum temperature is assigned to the day prior to the day of observation. In the UK the minimum temperature is assigned to the day of observation. In both cases there will be some (rare) days on which the readings can appear anomalous. You must feel rather parasitic Sou, when are you going to do your own work instead of sucking the blood from others ? "So, Nick, until your favorite rent-boys extract digit and publish their secret ACORN data, I fear you’ll have to wait …"
Climate deniers certainly have a way with words. Usually it is "metaphorical". Always it is juvenile and insulting. I think Sou does a very good job at pointing out when the fake scientists at WUWT get it wrong. Perhaps if they concentrated on quality rather than quantity. After all, Einstein only managed four papers in 1905. Gee, our meteorological day is 9am to 9am. We pay by the fortnight. Our financial year runs from July to June. When should we expect the invasion? Love the cheap insult - 'sleepyheads' - about 'getting up late'. What a child and a churl! I've known a couple of bureau forecasters. Have a guess what time they got up? HINT: go to the BoM site and check the time stamp of the first daily forecast. WUWT achieves nothing other than feeding the prejudices of the faithful. Now, there's a surprise! Yes, Bill. There they are sitting pounding their keyboards on anti-science websites and calling people who took the readings every day, year in year out, "sleepy heads". It wasn't even Bureau people who read all the thermometers around the country. It could have been anyone from the person who ran the night cart to the local postmaster and everyone in between. Oh, and we drive on the left. Won't someone think of the children? Postscript. Aren't we back in the land of surface-stations here? We're having a debate about trends, not assigning the dates of friggin' maxima, so whatever the quibble the Disciples of Willard Tony might want to inflate for FUD purposes, the BoM's historic convention makes zero meaningful difference. That's not the point though is it. Willis fabricates an "error" that isn't an error to add to the spin that the Australian temperature record is somehow "flawed". I'd say the temperature record here has to be at least on par with the best in the world. For a newly developing country it was amazing how quickly weather stations were set up all across the continent, and how well it was organised right from the outset. There are not too many, if any, nations that could compare back in time, especially when you think of the coverage of remote areas. And the definition in Australia has also changed over time, which unfortunately causes inhomogeneities. "Observation time: current standard for both maximum and minimum temperature is 24 hours ending at 0900 local time. During 1932-1963, midnight-midnight used at major stations (~50 Australia-wide? ), but 0900-0900 for max/1500-0900 for min elsewhere." I am happy the meteorologists in Australia are "sleepyheads". Reading the minimum temperature much earlier is not optimal. Then you may record one exceptionally cold night as the minimum of two days in a row. It fits to my prejudice that the regulars are WUWT prefer to sleep too little. If Anthony Watts would sleep more, Sou might have less work to do. Thanks, Victor - that's interesting about the changes in Australia over time. I'm not following the chart in your thought experiment. Should day 2 (the red at 10 am on the far left) start at about the temperature day 1 ends (the blue at 9 am on the far right)? I understand the notion of how the methodology will sometimes lead to an incorrect result. I also understand that those results can be detected and fixed by computer. Willis merely makes the observation that a data set that is already heavily adjusted and purports to be the most accurate available should be able to make the minimum temperature in any given day less than or equal to the maximum temperature. How can anyone consider this to be an unreasonable expectation? Robert, I'll try to get this clarified. BTW, Willis did quite a bit more than "merely" make an observation. He started off belligerently and ended up with more than belligerence, with accusations of fraud (accusing BoM of making "bogus claims" about the record hot summer in Australia). Wondering Willis is an unreliable source of "information" at best. He is just another run-of-the-mill denier (with passive-aggressive tendencies). So it sounds like you agree that it is a reasonable expectation that a scientific data set should get the minimum value less than or equal to the maximum value for a given interval. I reread the article (and scanned the comments) and it appears that the satellites tell a different story, hence the desire to scrutinize the land record. I do see Willis getting bothered toward the end of the article in that BoM has known about this particular problem for over a year and been unable to correct it. Then the comments do get pretty intense. As nearly as I can tell, every "fact" Willis presented is true. He may have placed a "spin" on it that bothers you. I do disagree with your characterization of Willis as run-of-the-mill. He is anything but. It may be a reasonable expectation to think a minimum would be *the* minimum but I can see how anomalies could occur. Regarding Willis trying to say all BoM data is "bad" because 0.045% of the data are anomalous and then linking it to the summer heat record, well that's just an example of how deniers operate. The satellite measures were for the lower troposphere (around 1.5 km above the ground AFAIK), not temperature at the surface. Science deniers typically look around to see if they can find the lowest temperatures wherever to "prove" whatever it is they want to prove. Used to be UAH as a matter of course, but since UAH is following GISTemp so closely these days they have to lower it by packaging it with RSS. Either that or they go with HadCRUT (despite their animosity towards CRU), though since version 4 has been released with a slightly better coverage of the Arctic, that's gone out of favour too. Incidentally, it wasn't just Australia where it was extraordinarily hot. It got pretty hot in some other parts of the Southern Hemisphere too, like parts of South America and southern Africa. Willis is a run-of-the-mill denier. Like many science deniers he's got a very inflated ego. Like Anthony, Willis gets unreasonably angry when anyone points out where he is wrong and calls anyone who understands science silly names. He generally ignores science except when he's saying "scientists don't know nuffin", is constantly "wondering" and making up dumb "explanations" about stuff that is well known. He's got a louder mouth than some, but other than that he's just your average science denier. "Long-term datasets present a range of challenges. They require digitisation of old paper-based records, as well as the identification and quality assurance for inconsistencies created by weather station site moves, changes in the surroundings, technology development and random errors. The Bureau of Meteorology's climate data experts carefully analyse records to find and address spurious artefacts in the data, thus developing a consistent – or homogeneous – record of daily temperatures over the last 100 years." What could be more spurious than min > max? Should we trust the other adjustments if they cannot get the right sign on this one. Having read a number of posts, our hostess makes a lot of good points. Defending min > max is not one of them. "Willis is a run-of-the-mill denier. " I still disagree. You run the risk of running out of pejoratives. What's the difference? One bit of waffle is no different to another. A case in point is in your previous comment. The only difference I see is that Willis waffles longer. BoM actually knows the reason for this and with an update will fix so people like Willis wont be confused.